Butanone, also known as methyl ethyl ketone (MEK),[a] is an organic compound with the formula CH3C(O)CH2CH3. This colorless liquid ketone has a sharp, sweet odor reminiscent of butterscotch and acetone. It is produced industrially on a large scale, and also occurs in trace amounts in nature. It is soluble in water and is commonly used as an industrial solvent. This is used to produce approximately 700 million kilograms yearly. Other syntheses that have been examined but not implemented include Wacker oxidation of 2-butene and oxidation of isobutylbenzene, which is analogous to the industrial production of acetone. The cumene process can be modified to produce phenol and a mixture of acetone and butanone instead of only phenol and acetone in the original. Both liquid-phase oxidation of heavy naphtha and the Fischer-Tropsch reaction produce mixed oxygenate streams, from which 2-butanone is extracted by fractionation. Butanone is an effective and common solvent and is used in processes involving gums, resins, cellulose acetate and nitrocellulose coatings and in vinyl films. For this reason it finds use in the manufacture of plastics, textiles, in the production of paraffin wax, and in household products such as lacquer, varnishes, paint remover, a denaturing agent for denatured alcohol, glues, and as a cleaning agent. It has similar solvent properties to acetone but boils at a higher temperature and has a significantly slower evaporation rate. 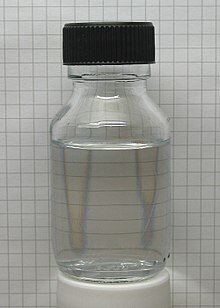 Unlike acetone, it forms an azeotrope with water, making it useful for azeotropic distillation of moisture in certain applications. Butanone is also used in dry erase markers as the solvent of the erasable dye. As butanone dissolves polystyrene and many other plastics, it is sold as "model cement" for use in connecting parts of scale model kits. Though often considered an adhesive, it is actually functioning as a welding agent in this context. In the Peroxide process on producing hydrazine, the starting chemical ammonia is bonded to butanone, oxidized by hydrogen peroxide, bonded to another ammonia molecule. In the final step of the process, a hydrolysis produces the desired product hydrazine and regenerates the butanone. Butanone can react with most oxidizing materials, and can produce fires. It is moderately explosive, requiring only a small flame or spark to cause a vigorous reaction. Butanone fires should be extinguished with carbon dioxide, dry agents, or alcohol-resistant foam. Concentrations in the air high enough to be flammable are intolerable to humans due to the irritating nature of the vapor. Butanone is a constituent of tobacco smoke. It is an irritant, causing irritation to the eyes and nose of humans. Serious health effects in animals have been seen only at very high levels. These included skeletal birth defects and low birth weight in mice, when they inhaled it at the highest dose tested (3000 ppm for 7 hours/day). There are no long-term studies with animals breathing or drinking it, and no studies for carcinogenicity in animals breathing or drinking it. :96 There is some evidence that butanone can potentiate the toxicity of other solvents, in contrast to the calculation of mixed solvent exposures by simple addition of exposures. As of 2010[update], some reviewers advised caution in using butanone because of reports of neuropsychological effects. Butanone is listed as a Table II precursor under the United Nations Convention Against Illicit Traffic in Narcotic Drugs and Psychotropic Substances. Emission of butanone was regulated in the US as a hazardous air pollutant, because it is a volatile organic compound contributing to the formation of tropospheric (ground-level) ozone. In 2005, the US Environmental Protection Agency removed butanone from the list of hazardous air pollutants (HAPs). ^ The international standards group IUPAC has deprecated the term methyl ethyl ketone, and now recommends using ethyl methyl ketone instead. ^ Merck Index, 11th Edition, 5991. ^ a b c d Nomenclature of Organic Chemistry : IUPAC Recommendations and Preferred Names 2013 (Blue Book). Cambridge: The Royal Society of Chemistry. 2014. p. 725. doi:10.1039/9781849733069-FP001. ISBN 978-0-85404-182-4. ^ a b c d e f NIOSH Pocket Guide to Chemical Hazards. "#0069". National Institute for Occupational Safety and Health (NIOSH). ^ a b "2-Butanone". Immediately Dangerous to Life and Health Concentrations (IDLH). National Institute for Occupational Safety and Health (NIOSH). ^ a b Wilhelm Neier, Guenter Strehlke "2-Butanone" in Ullmann's Encyclopedia of Industrial Chemistry, Wiley-VCH, Weinheim, 2002. ^ a b c d e Turner, Charles F.; McCreery, Joseph W. (1981). The Chemistry of Fire and Hazardous Materials. Boston, Massachusetts: Allyn and Bacon, Inc. p. 118. ISBN 0-205-06912-6. ^ Apps, E. A. (1958). Printing Ink Technology. London: Leonard Hill [Books] Limited. p. 101. ^ a b c Fairhall, Lawrence T. (1957). Industrial Toxicology. Baltimore: The Williams and Wilkins Company. pp. 172–173. ^ Schwetz; et al. (1991). "Developmental toxicity of inhaled methyl ethyl ketone in Swiss mice". Fundam. Appl. Toxicol. 16 (4): 742–748. doi:10.1016/0272-0590(91)90160-6. ^ "Methyl ethyl ketone (MEK) (CASRN 78-93-3)". Integrated Risk Information System (IRIS). EPA. 26 September 2003. Retrieved 16 March 2015. ^ "U.S.Toxicological review of Methyl ethyl ketone In Support of Summary Information on the Integrated Risk Information System (IRIS)" (PDF). U.S. Environmental Protection Agency. September 2003. p. 152. Retrieved 16 March 2015. ^ Thompson, S.B.N. “Implications for cognitive rehabilitation and brain injury from exposure to Methyl Ethyl Ketone (MEK): a review.” Journal of Cognitive Rehabilitation 2010; 28(Winter): 4-14. doi: jofcr.com/vol284/v28i4thompson.pdf. ^ Barbara Kanegsberg (n.d.). "MEK No Longer a HAP". Bfksolutions newsletter. Archived from the original on 2 April 2015. Retrieved 2 April 2015. After technical review and consideration of public comments, EPA concluded that potential exposures to butanone emitted from industrial processes may not reasonably be anticipated to cause human health or environmental problems. ^ "EPA De-Lists MEK from CAA HAP List". www.pcimag.com. Retrieved 2016-07-30.